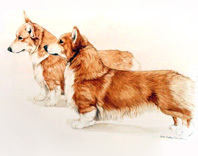 Home > Herding Group > Pembroke Welsh Corgi "Pair"
The Pembroke Welsh Gorgi "Pair" is a Limited Edition, signed and serial numbered print created from the Original Watercolor Painting by Martha Van Loan. Each print is 11"x14" with white margins and will fit into a standard 16"x20" mat and frame. See our framing and matting options for specials to make your purchase ready to hang.